With the coming of spring and the warmer weather the beaches of Cape Town once again come into their own. This however is not good news for the African Black Oyster Catchers who nest above the high water mark on our South African coastlies. They are one of the rarest sea birds along our coastlines and with only about 5000 pairs left are on the endangered list. 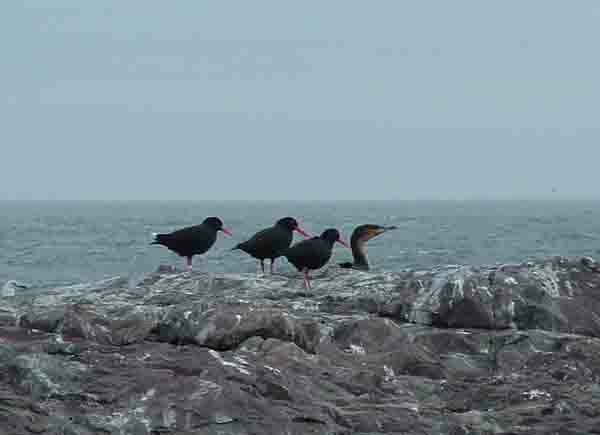 Oyster Catchers breed in other parts of the world but this is the only species that breeds in Africa. The birds are quite distinct as there are normally two of them together. The African variety is a medium size bird with black feathers and a long red beak. It uses this beak to forage on the rocks and beaches for limpets, muscles and any sea mollusc that it can find. As the Oyster Catcher can only feed at low tide when muscle banks are exposed it is one of only a few birds that feeds in the day and at night. As birds go the Oyster catcher is one of the longer living birds with a life expectancy of up to thirty five years. Another interesting fact is that they usually only have one partner in a lifetime and normally only breed after three or four years. On a visit to Yzerfontein recently I came across a number of Oyster catchers sitting on a rock near the sea. There were a number of other seabirds with them and it appears that the birds believe in safety in numbers. As I wanted to get some photos of them I approached the rock they were on by devious means to try not to scare them away. I got reasonably close and then one bird let out a warning cry and they all flew away. 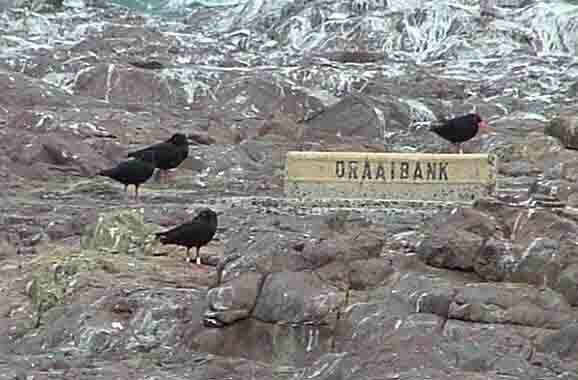 The other sea birds in the group sheltering on the rock did not move at all. On examining the photos later I noticed that two of the birds had white rings on their legs so they must have been captured sometime in their lifetimes as chicks. As there were four Oyster Catchers in the group and the ringed birds appeared to be older I assumed the second pair were their chicks. Its good to know that the birds have chicks reaching maturity along the west coast. Next time you visit the west coast see if you can spot these rare birds feeding along the shore. With a bit of luck you might even come a cross the baby chicks on the rocks feeding like I did a number of months ago. If you do find them watch them from a distance as they go about their business.